Guest Names: Facilitated by Paul Thangam & Aravind Chartered Accountants – CA. The programme will be facilitated by Paul & Aravind Chartered Accountants – CA. P.PaulThangam & CA. P.AravindThangam. The firm has 26 years of experience in Tax Advisory services, Corporate Statutory Compliance and Debt Syndication and serves for clients in diverse sectors with turnover above Rs.1,000 crore. Both the facilitators are approved for GST education by The Institute of Chartered Accountants of India. CA. P.AravindThangam has undergone a special training session at NACEN (National Academy for Customs, Excise & Narcotics, Faridabad – the IRS Training facility for training the Rank ‘A’ Officials of the Government of India) and is an ‘Accredited GST Trainer’ of the Government of India. Both the facilitators are well-acclaimed speakers and have addressed at various sessions at Coimbatore, Erode, Salem, and Chennai. They advise various leading corporates in and around Coimbatore on GST and have conducted GST Impact Study for many corporates. The Goods and Services Tax (GST), a unified system of taxation for goods and services is proposed to be brought into force. The Central Goods and Services Tax Act, 2017, Union Territory Goods and Services Tax Act, 2017 and Integrated Goods and Services Tax Act, 2017 has received the assent of the President of India on 12th April, 2017 and has been Notified on the same date. Based on the discussion in the Public domain, the GST Law is said to come effective from the 1st day of July, 2017. With the introduction of GST, the existing taxes viz., – Central Excise, Service Tax, VAT, entry tax, etc. will be subsumed and the new era will be the era of taxation of ‘supply of goods and/or services’. The new system of taxation has brought in substantial changes for the taxation of goods and services with respect to Supply, Input Tax Credit for Interstate Purchases, Advance Received, Input Tax for Traders, Eligibility for Input Tax, Time limit for claim of Input Tax Credit, Interstate Sale under IGST and E-Way Bill. 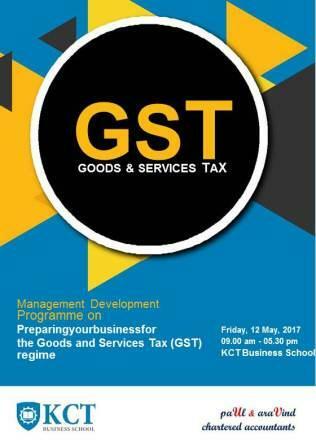 To understand the developments in GST further and to prepare the businesses to swiftly adapt to the GST regime, KCT Business School and Paul & Aravind Chartered Accountants have organized the Management Development Programme to help the businesses in understanding the legal and practical aspects of migrating to the GST regime.